Northwest National Real Estate: Sold! Mobile Home! 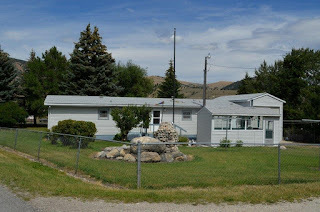 Manicured landscaped completely fenced yard, very clean two bedroom, two bath, 24x60 Detitled Marlette Double wide Home West of Anaconda, Montana. The home is on a large corner lot, with great views of Mount Haggin. There is a two car attached garage that walks into another large garage to fit your motor home or the rest of your toys. Many upgrades and furnishings that are there will stay with sale. This property is in great shape and move in ready. Enjoy out of town living! Listed at $98,500.